Cables seem to be in vogue once again in myriad permutations. They pose some interesting issues when created in machine knitting. 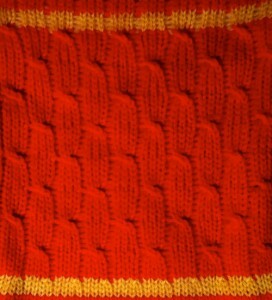 Interweave Knits Winter 2011 published an article on “Cables 101” that includes a way to color code and graph cable crossings. Some complex variants for those who like KM hand techniques may be found at Knit, not Knit , their courses here. “Back in the day” of regular, world wide machine knitting seminars several authors provided collections of machine knit cables including George Le Warre at Passap universities (copyrighted, George presently in England). Simple crossings are a good place to begin and produce texture. 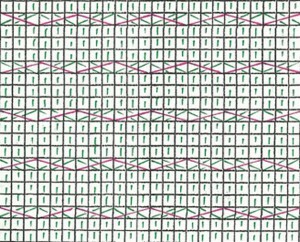 If one is not interested in freeform but rather constant, recurring patterns it is possible to use punchcards to produce visual cues when stitch twists and crossings are to occur. This is not an option in Studio Machines, easy on Brother because of the fact that needles pre select, and Passap pushers may be used for a similar set of clues with a bit more fiddling. The choice then remains whether or not to revert the crossings to match the HK pattern. One way to do that is simply to reverse positions for colors. The mantra becomes “red moves first, green moves second and over red”. With all machines if the knit carriage is left set for normal knit, even if the patterning option is engaged (KCI or KCII if there are any needles out of work) needles will be selected, but the fabric produced is stocking stitch. The usual considerations are in order: the number viewed on the card outside the machine corresponds to the design row being read by the reader, but the punchcard holes in view are not necessarily the same as the design row selected. Because one is producing the cables on the purl side of the knit, if hand knitting charts are used the cables themselves will be mirrored. In many instances this may not matter, but if one is using the twists for representational crosses ie. in trees, owls, diamonds and other geometric shapes, it is a good idea to scan the repeat, mirror the image vertically, and then begin translating it into machine knit interpretations. Relatively easy with simple scanning and printing software (ie. the flip horizontal function in Preview, a bit harder by hand. When I can I color code my cards: ie. with lace I draw a line across the card when I reach each knit row sequence with color pencil. 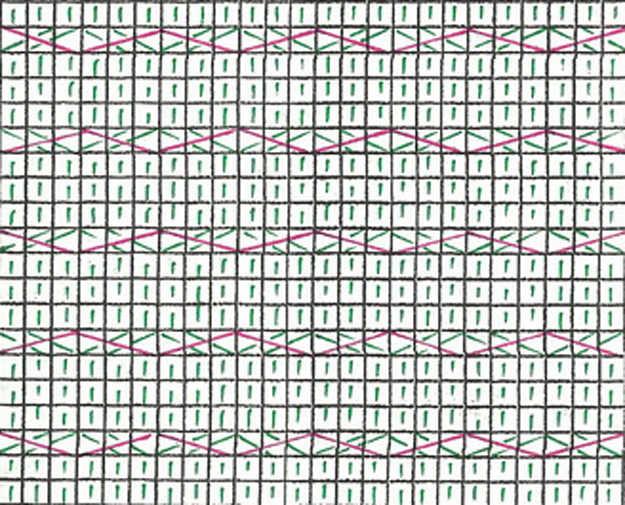 This provides me with an easy to follow visual cue as to when the rows must occur, and also facilitates returning to previous selection sequence when mistakes in patterning occur. 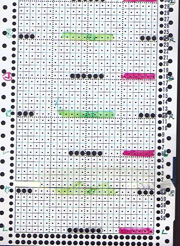 Some basics: with a punchcard there is no row length limitation, but repeats are limited to 24 or a factor thereof. In this particular use wherever needles are selected, one has a visual reminder to move those needles in the desired direction. I used the cards below to illustrate the idea in my intro to knitting classes. When needle selection occurs in the first, remove the selected stitches off the machine with a 3 prong tool in each desired location, then insert a second 3 prong tool back through front of those same stitches, in turn removing from the initial tool used. 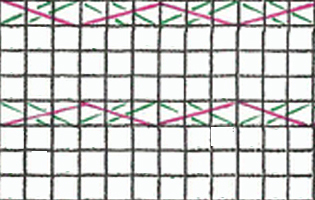 Rotate the twice transferred stitches 180 degrees consistently either clockwise or counter-clock wise throughout, and return them to their original position on the needle bed. 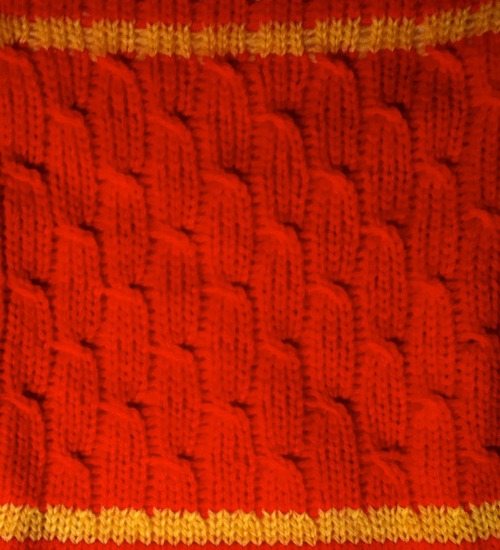 The result is a consistently textured fabric with no counting stitches or rows between repeats. This card begins to address regular cable crossings, mine was punched in repeat the full 60 rows. A color may be assigned to help with opposing twists’ directions ie. to left (pink) or to right (green) when the corresponding color bar appears just above the card reader.